Many thanks to all the staff, volunteers, spectators, runners and police officers at the Philadelphia Marathon on Sunday. I was blow away - pardon the pun ;-) - by all the support! Since 2013, I failed 11 attempts to qualify for the Boston Marathon (BQ). On Sunday, November 20, I finally succeeded at my 12th attempt and qualified for the 2018 Boston Marathon at the 2016 Philadelphia Marathon! I'm so very grateful for every opportunity to help fight childhood cancer one mile at a time with Alex's Lemonade Stand Foundation's Team Lemon. 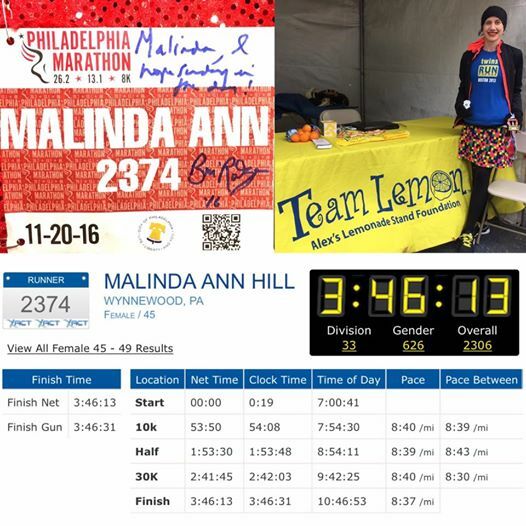 Thanks to all who have donated to our fundraising pages since we started running with Team Lemon in 2012 in memory of Leah's brother-in-law, Michael, and our grandmother, GG. I'm also very grateful for the opportunity to run the 2017 Boston Marathon with Leah as a charity runner with Dana-Farber Marathon Challenge (#RunDFMC) to support Dana-Farber Cancer Institute. Did you write a race recap? Share your link in the comments and we'll add to our lists. Thanks for sharing my recap and congratulations on your BQ! !